As a new race of Mists of Pandaria, the Pandaren live in a new continent which was on the back of a giant turtle. Their home is beautiful and isolated, full of mysteries. This race is neutral, not concern about the conflict between Horde and Alliance. Yet the furry lovely Pandaren are also brave explorers and fighters. Now follow them, they will guide you to explore the mysteries on continent of Pandaria. In a place that far away from Azerth, lives an oldest race, the Pandaren. In the time that the world was still unbroken, the Pandaren were ensalved by Mogu, another cruel race lived on the land. Yet they were brave to fight back and successfully protected themselves and their home. The land they live, Pandaria, is so much different with other places in World of Warcraft. Surrounded by bamboo forests, red ornate temples standing on hills, and white clouds floating on blue sky, the continent of Pandaria is full of eastern atmosphere. You begin by proving your worth to Pandaren elders by recruiting elemental spirits to a central temple in Pandaria's starting zone. The starting quest of Pandaria is simple. You can finish them fast. They are mainly killing and collecting, and only few are slightly harder. While many players are excited about this new race, others are less than pleased with it. 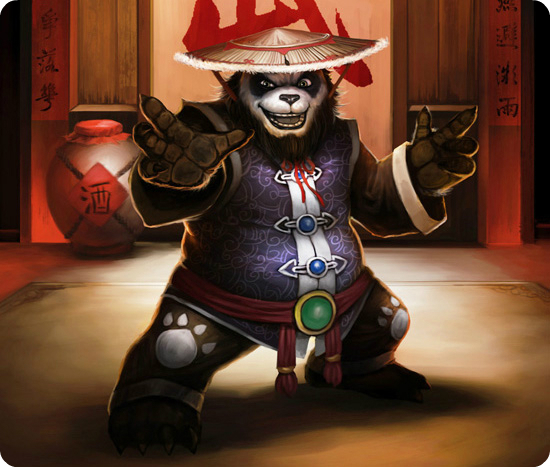 Being a neutral race, Pandaren will be aligned with Horde or Alliance after level 10. The fact that the Pandaren will be the first race to be played by both Horde and Alliance has further perpetuated the battle lines between supporters and opponents. Whether playability of the race will make any change still remains to be seen. Yet the choice must be made to choose a side. So is the choice of class. If you want a Pandaren, you don't need to choose to be a monk. 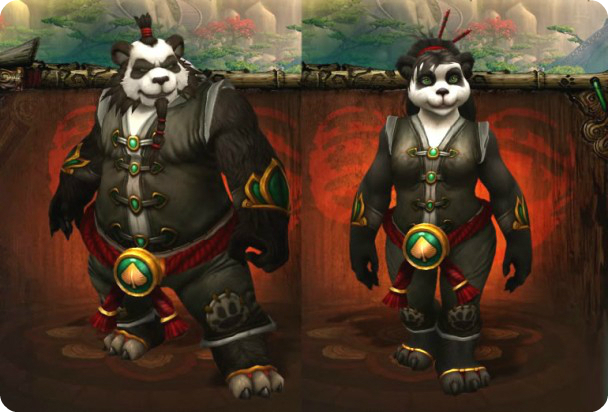 Except from Paladin, Warlock, Druid and Death Knight, other classes are available for Pandaren. But I guess, there will be many more Pandaren Monks than other classes. The Monk class can be specialized in tanking, healing or melee DPS. When being a DPS, the Monk uses two resource systems: energy and chi. You can use a basic attack, called Clobber with a staff equipped, that consumes energy and creates on point of chi. Up to four chi points can be stored and used to trigger other attacks. The Tiger Palm attack consumes one chi and deals additional damage if the enemy is above half health. Another attack, Blackout Kick, only becomes available after an enemy is knocked down to 35 percent health, and consumes two chi, though will refund one chi if the kick is the killing blow. - Epicurean: Increases the stat benefits from food eaten by a Pandaren by 100%. - Gourmand: +15 to Cooking skill. - Inner Peace: Gain double rested experience. - Bouncy: Reduces fall damage by 50%. - Quaking Palm: Allows the Pandaren to put the enemy to sleep for 3 seconds.